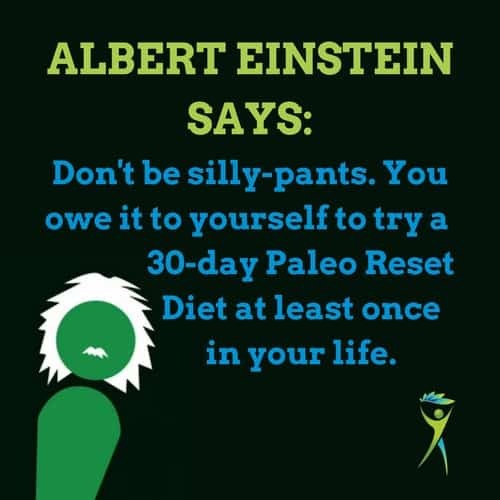 Albert Einstein says "Don't Be Silly-Pants and Try A Paleo Reset Once in Your Life"
Doctor’s Note: In this post, I don’t discuss any logistics about the Paleo Diet. I’m writing to express the behavioral psychology aspects of diet and the anecdotal results that are possible by simply, eating natural foods that you’re supposed to eat. We have a bottomless bowl of chocolate almonds in our office at Barefoot Rehab. It’s a tiny way that we can love our patients a little bit more. How come you don’t weigh 300 pounds with those chocolate almonds in your face every day? Because if I have one chocolate almond, I will be 300 pounds. So I don’t allow myself one. I fear turning into one of the kids from those darn marshmallow experiments! Don’t get me wrong, chocolate almonds are delicious. But I’ve already paid the price for them in the past. The sugar causes extreme fatigue in me two hours after consumption. The gluten (Chocolate does not inherently have gluten. However, chocolate often has additives or is cross-contaminated with gluten.) causes bloating, digestive pain, and constipation usually immediately to 48 hours after eating. So I don’t go there. But, I did go there in the past. I hadn’t tried a strict 30-day paleo reset diet until my mid-twenties. As an adolescent, I hated using public bathrooms. Germs scared me. My worst nightmare, which happened several times per month from middle school through college, was having extreme pain in my colon that meant I was either releasing bodily waste in my pants or in the toilet. Urgently looking for any nearby bathroom, I chose the toilet. Chris, we can’t hear you with your hand in front of your mouth. My mom and grandfather were well acquainted with metamucil. It tasted like a watery, orange gatorade. They took it for their constipation and told me to take it too. I did. I could never tell if it worked. Unrelenting bathroom urges, acne, and constipation were a few of the major issues I dealt with, thinking that those physiologic effects were normal. In the past, there was no cost-benefit analysis to do because I didn’t see any other way. Conventional medicine hadn’t shown me that I could feel any different. The answer to my acne and eczema was creams, lotions, and chronic washing. The answer to my bathroom issues was metamucil and always having a toilet within a 30 second speed-walk nearby. We all think that the things we’re dealing with are normal. No one in the government, in the conventional medicine or healthcare system, or generally part of the collective Matrix is going to stand up and advocate for ourselves. Anything these institutions tell us is keeping us victims. That’s why taking 100% responsibility for our place in life is of paramount importance. Taking the power back means losing the victim mindset and choosing to get behind the driver’s wheel of our body again. Sometimes, our health issues can’t be fixed. Other times, we are pleasantly surprised when they go away. Thing is, we don’t know until we try. Hidden in Einstein’s message is how important perspective, what we are conscious of and can see, is. If you can’t see any other way out, of course you’re going to keep doing what you’ve always been doing. You need to have hope that doing something different is going to produce something different. I had a crazy friend in chiropractic college who learned about Paleo, went strict (weird), went sober (even weirder), and then claimed that he felt better than he ever did in his entire life (thank you Thomas I.). Thank God Thomas is super handsome because he is crazy with all of this health stuff. And we were going to be doctors! poops became amazing and felt the way poops are supposed to feel – good! acne cleared out completley (although it had cleared out some after puberty ended). mental fog that I thought was a sign of depression’s welcoming went away. I was so impressed with the diet that I continued eating that way for years, up to today. I eat “Paleo” 90% of the time, choosing to “cheat” here or there based on the company I’m with and what my eyes feel pulled towards. As long as I keep my “cheats” to a minimum, those previous health symptoms that I thought were normal stay at bay. My partner Katie was able to go off of the steroid creams that she was on for a decade and keep her psoriasis cured by 80% with a Paleo Reset Diet. I currently have a patient trying a strict Paleo Reset Diet and he told me yesterday that he’s off his stomach distress medication and he feels better than he has in years. Over the winter, I had a young female patient with chronic low back pain around her period eat a Paleo Reset Diet and found that the pain around her periods was better by 75%. Are you starting to see anything differently? Can you see the possibilities? The current numbers are that 1 out of every 2 of us humans has a chronic disease. 1 out of 4 of us has multiple chronic diseases. According to Bruce Lipton from Biology of Belief fame, 95% of those with chronic disease can be cured by making new lifestyle choices. With the #1 lifestyle change being diet. Can you see the possibilities for yourself? Do you now have the perspective that you may have been eating in a way that was keeping you sick? Or leaving your skin itchy? Or causing your bowels to twist and wreck havoc? Don’t be silly-pants. You owe it to yourself to try a 30-day Paleo Reset Diet at least once in your life. Here are two calls-to-action for those who are ready to clean out their bodies. I will be speaking about the Paleo Diet at the Wellness Gala’s Autoimmune Symposium Event on Sunday, March 11, in Parsippany, NJ. Cost is $60 in advance or $70 at the door. Come learn more about new, cutting edge technologies around autoimmune conditions. Ready to join an accountability group to do the 30-Day Paleo Reset Diet together? Our pain clinic, Barefoot Rehab, is running a reset starting Monday, March 18, for 25 people who are ready to take their diet (and health) seriously. We’re offering a money-back guarantee to anyone who doesn’t see extraordinary results. The cost is normally $250 but for anyone who registers by Saturday, March 10, the cost is $199. –> Join us by emailing scheduling@barefootrehab.com and tell us a little bit about why you’re motivated to see what Paleo has to offer you. You have no idea how good you can feel until you clean your body out of poisonous foods and fill it up with the most nutritious foods possible. Once you know the cost of eating the foods you used to eat, avoiding the chocolate almond or marshmallow becomes much easier. What has your experience been like trying to change your diet? Did you fail? Did you succeed? Why or why not? Dr. Chris on Why Do These Muscle Knots Always Come Back After Getting Them Worked On? Brittnee P on Why Do These Muscle Knots Always Come Back After Getting Them Worked On?